SoundFlow battery phone case not only protects your precious smartphone and provides extra battery life, but also allows you to enjoy your favorite music with a pair of custom true wireless earbuds. Cool? Let’s continue checking. The SoundFlow is an innovative and versatile phone case that is available in multiple models for iPhone X/XS/XS Max, iPhone 6/6s/7/8, iPhone 6/6s/7/8 Plus, Pixel 2/3/2 XL/3 XL, Galaxy S8/S9/S8 Plus/S9 Plus and Galaxy Note 8/9. As we can see from the images, the phone case shows off a low-profile and sleek appearance design, and the slim form factor and smooth sides let you comfortably hold it in your hand and easily slide it in your pocket. Meanwhile, the case is made from hard polycarbonate plastic blend with velecron soft touch coating in order to protect your phone from shocks and scratches. More importantly, the phone case come equipped with a pair of true wireless earbuds. Each earbud features an 8.3mm high-fidelity micro driver plus Bluetooth 5.0 and aptX HD in order to produce high-quality stereo audio, and built-in dual microphones reduce let you answer or make clear handsfree calls. Using multiple pairs of eartips and fins, the Bluetooth earbuds deliver a custom and comfortable fit for every user. 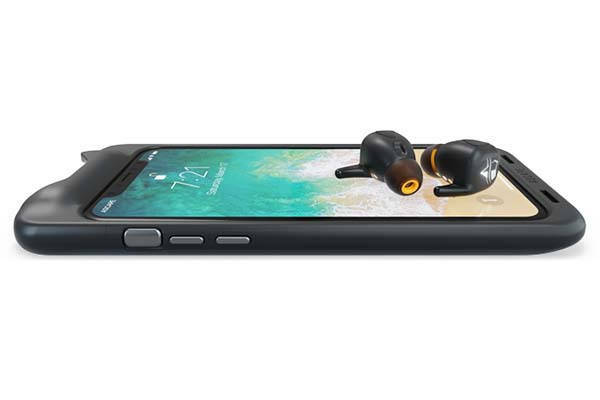 The IP56 rating ensure the earbuds withstand sweat, dust and rain for both indoor and outdoor use. When not in use, the earbuds can be stored in the seamlessly integrated dock on the top of the phone case. Moreover, as a battery case, the SoundFlow features built-in 2600mAh – 3750mAh rechargeable battery so that you can use it to charge your smartphone or the wireless earbuds. In addition, the earphones offer 8 hours of music playback, and an optional battery case extends the battery life to 50 hours. The team behind SoundFlow is raising fund for the product on Indiegogo. 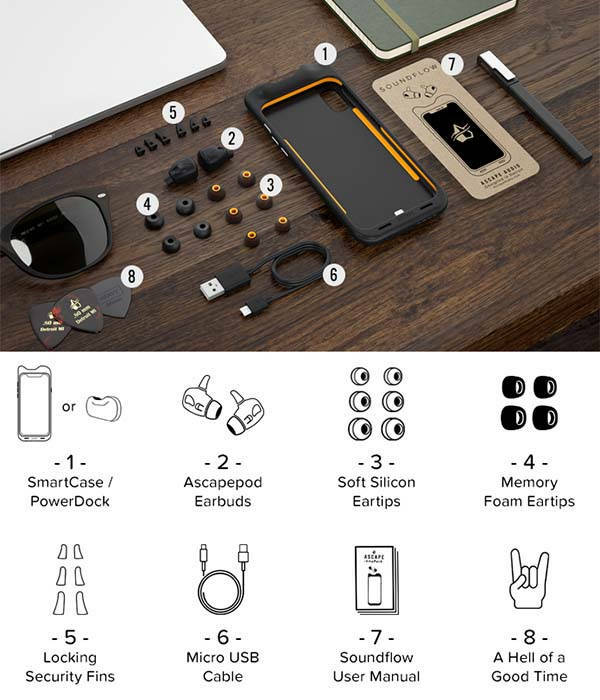 We can pledge $99 to preorder the battery phone case with truly wireless earbuds. It will be shipped in February 2019.